So with all the talk of schoolhouses and trees and foundations, let me demonstrate how my little scatterbrained self operates, "Oh no," she says "my paint strippers have eaten through the craptastic $99 vanity the previous owner installed! And it's just a week until 60 people descend upon my house, they won't eat my food if they think I wash things in this sink! I'd better just rip it out, I have all the parts to assemble the new one anyway!" About two years ago, in my search for antique exterior crown molding I came across an artist who was as obsessed with architectural salvage as I am, only he had a warehouse. Most of what he had stashed there wasn't for sale, but he liked to sell what he didn't plan to use to fund more purchases. 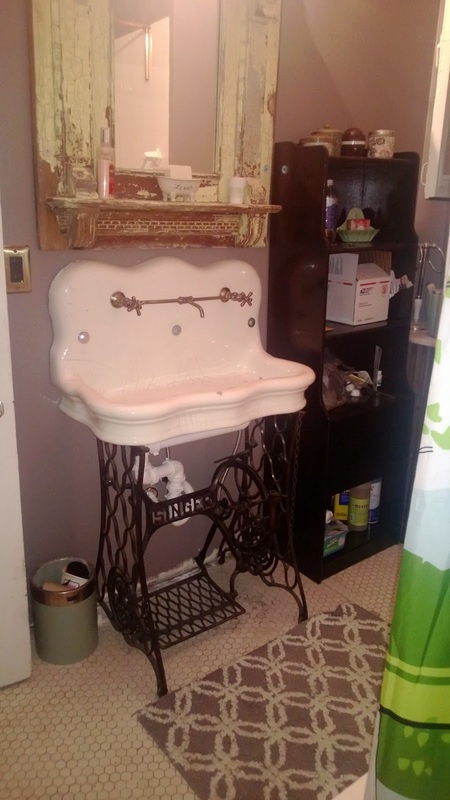 In addition to piles of nearly the exact trim I needed, I brought home bundles of beadboard, some miscellaneous hardware, and a rather glorious old sink, although it's original purpose is unclear. A few readers that have seen my basement in person know that I am a hoarder of old porcelain (at one point I had no less than six enormous antique sinks in my basement), but this sink trumps all the others in that it's china, and that it was made the same year as my house was built. 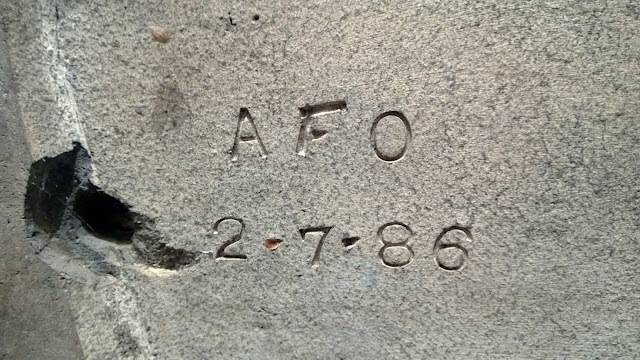 AFO, brand, initials, anyone know? 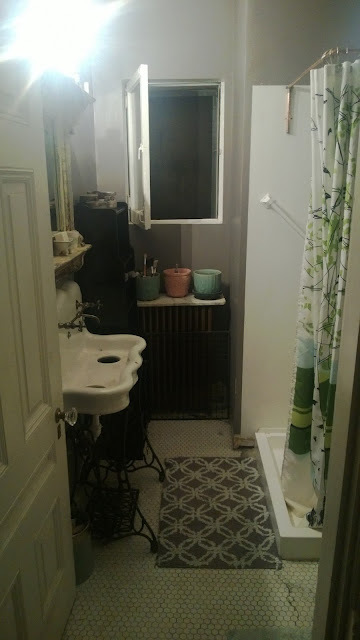 When I bought it I saw that drain wise it would take 2 modern kitchen sink drains (literally the most important thing other than condition, at worse, you can use a single tap faucet, but without a drain you don't have much of a sink). Despite the fact that we could have used single tap faucets (which it may have had originally), the trained monkey is a fan of warm water (as opposed to hot and cold), so we had a bit of a standoff. Enter DEA Bathroom Machineries - a few years ago they produced an adjustable width bridge faucet, where the bridge sections could be cut down as needed to fit unusual antique sinks like this one. When I first contacted them (best customer service anywhere by the way, they respond to crazy people like me right away via e-mail, even when I'd never bought anything from them) they said they'd be producing it in a few additional finishes in the following year, including the raw brass I was interested in, so I decided to wait, because faucets are expensive. I randomly checked their website a month ago, and to my horror couldn't find the faucet. I finally tracked it down in the clearance section, where they had one left in oil rubbed bronze with flaws to the casting/finish. In a panic I e-mailed to find out what was going on and was told this was the last one available as California had passed new lead laws. Needless to say I ordered it (it being 2/3 off the original price was a plus). 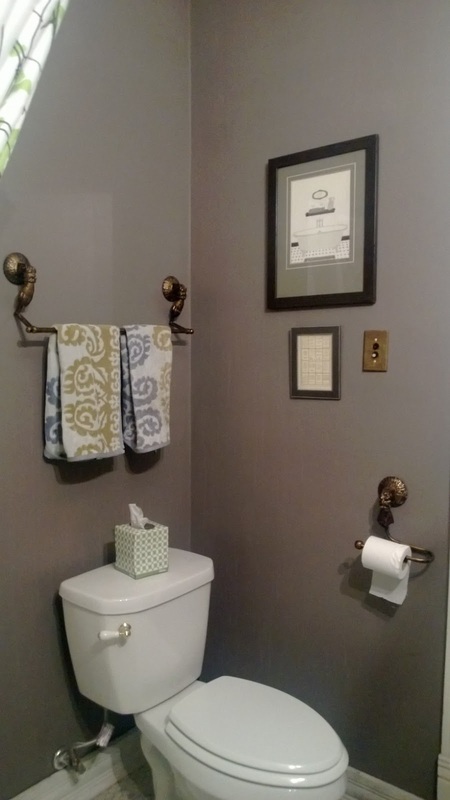 As it turns out, it had no flaws what-so-ever, and it was a beautiful antique brass color. So now we had a sink and a faucet, and as it turns out we had a base too, in the form of a machineless iron Singer sewing machine base. I'd like to say these three things were instant friends, but I'd be lying. The faucet is designed to be deck mounted, not wall mounted, so we had to knock out some drywall behind the sink to accommodate the supply lines. The drains were also a bit reluctant to play nice, the bottom of the sink was nearly too thick for standard drains, and too irregular for a good seal with the drains designed for fireclay sinks. After much cursing and saying it couldn't be done, we got it done, but we have a convoluted mess of pvc underneath which will hopefully be less of an eyesore when painted black. 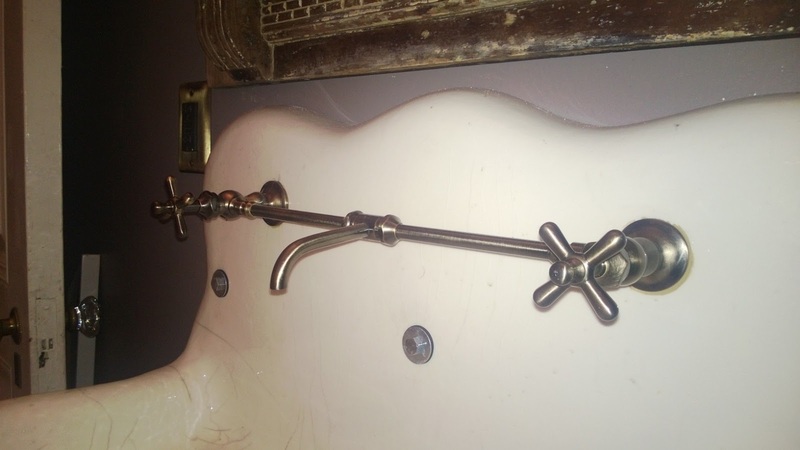 If we ever find a decent plumber the pvc will be tossed in favor of brass or copper. All this, just so our house guests could wash their hands . . .
That is one of the best sinks I've ever seen. I love it! I love it too, the awful pictures don't do it justice, it's covered with the most beautiful crazing! I'm glad they're so heavy, or else I'd have an army of them biding their time in the basement . . .
That sink is pretty impressive, but myself, I'd built it a cabinet. 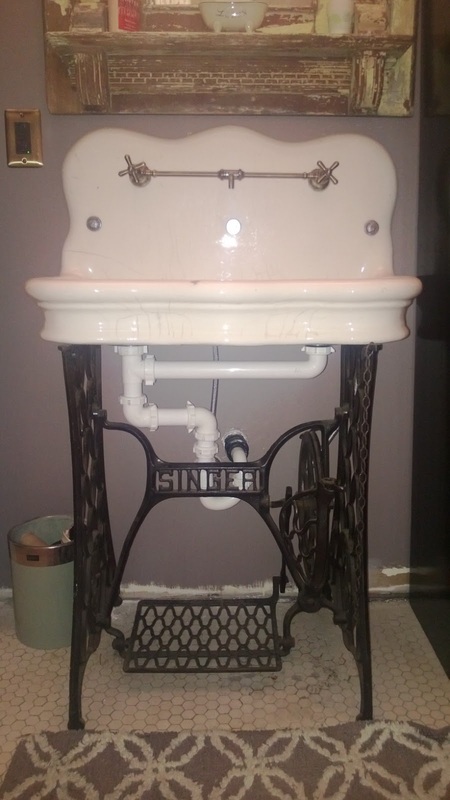 The sewing machine stand may be very sturdy, but visually it makes it look like any minute the sink will cause it to collapse. Just imho. How to these stands wind up separated from the sewing machines? Actually, the whole purpose of the exercise was to rid the bathroom of the cabinet that used to be there, as it's quite a small space. As for the sink, it's actually designed to be wallmounted, but in its advanced age I didn't want to stress it unnecessarily. When electric sewing machines replaced the treadle types, a lot of people kept only the drawers and bases, used to store things in the basement, and to make patio tables out of respectively . . .